Posted on October 16, 2014 October 16, 2014 by JumpKing Trampolines, U.S.
Having an impressive trampoline at home is one of the best options for your kids. But it’s really difficult to estimate how many of us really follow the basic safety tips while making great fun on our home trampoline. Let us quickly get into knowing the most important things our kids should follow when it comes to jumping and tumbling. For the youngest ones with ages 5 or below, the standard sized trampoline is not recommended for a number of reasons. 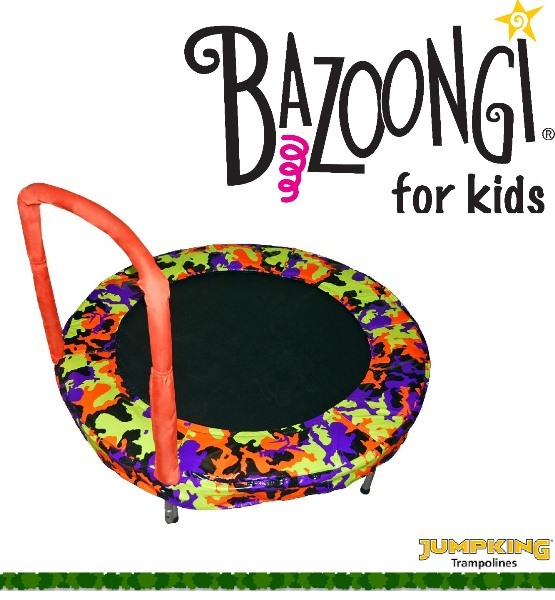 We recommend providing them 48” Bazoongi Bouncer Trampolines that integrates a strong and durable handle support with it bringing greater easiness and convenience to the kids. Never leave them alone. Kids are always excited while jumping and tumbling. They merely remember the basic guidelines and safety tips while making fun on their home trampoline. Making sure that you fully supervise them during the activity is one of the best options to protect your kids from various mishaps. If your kids have formed a group, never allow them to step onto the jumping surface together. It is much more vulnerable if they are going to jump all together. According to the majority of trampoline experts, choosing the center of the jumping surface is recommended as the best spot. The primary reason for choosing the center is just that your kids get enough room to get back to the surface without falling away from the trampoline. The trampoline anchor kit is one of the best and most essential accessory you should install with your home trampoline as it holds the entire component strongly to the ground and prevents from the high speed of wind. Don’t just look inside it, experts suggests clearing up almost 8 feet of the area all around the trampoline making sure that your kids are enough protected from the surroundings in any worst case scenario. Never allow your kids to practice or exercise professional moves or tricks that athletes do. Falling away from the jumping surface is extremely dangerous especially for your younger kids. There is a huge probability of causing neck, shoulder, arms and leg injuries. Apart from following these essential safety tips and guidelines, trampoline experts all around the world suggest doing a complete warm-up session prior to start jumping. On the other scientist with concrete findings, conclusions and proofs have identified that jumping is the best physical exercise for a number of today’s common diseases and concerns found in the United States. From Obesity up to boosting up the respiratory and cardiovascular systems of the body, trampoline has got a lot of benefits more than we ever thought. Everything comes with a handful of limitations but adapting to everything that is essentially required ultimately brings you and family great fun.